Case Studies > Distribution > TTI, Inc.
"Without exception our customer feedback has recognized our warehouse and operational capability as being industry-best"
TTI, Inc. distributes passive electronics products, which are the lowest unit-priced components in the electronics arena. The company has been successful in executing its specialization while the industry as a whole has pursued more glamorous, more costly products such as semiconductors and computer-related products. TTI's business model is designed to simplify the purchase of passives, which allows buyers to concentrate their efforts on the larger dollar expenditures where greater cost savings can be achieved for the time spent. From the beginning, TTI's mission was to offer extensive inventories, exceptional product knowledge, and superior customer service. The company has seen its size double in the past twelve months, and has seen a fivefold increase since 1995. "We're in a business that experts say we can't make a business out of," said TTI Senior Vice President of Corporate Operations, J.D. Beasley. "It's the 'low end' of the electronics business. Our average selling price is very low. We have to be expert in getting products in and out. You can't touch the items three or four times, or your profit is gone. There are products we sell by the truckload every day that sell for less than a penny." When a company has the kind of product storage and flow considerations TTI does, the way it stores and handles materials is crucial. TTI maintains 181,000 SKU's in the building, and routinely adds 1,000 brand-new part numbers a week to the inventory. "We've been doing that steadily," said Ty Golden, TTI's Manager of Warehouse Operations. "We did a detailed study; we hired consultants; I laid out for them what I wanted. First and foremost, I wanted to get rid of our totes," said Beasley. Totes were integral to TTI's operations, but the company realized that it needed to rid itself of totes in its distribution operations to reach its goals for efficiency and customer service. Said Beasley, "I wanted to pick in real time, eliminating the need for totes. 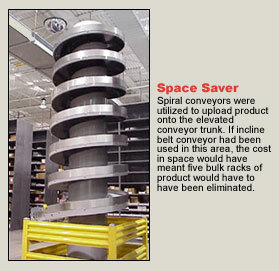 I wanted to move our products from one end of the plant to the other without a roller conveyor. After a long and expensive process, the consultants said it couldn't be done. TTI decided to do it themselves. Then Beasley and the TTI staff went to work. In TTI's previous system, each operator was assigned two carousels, which was considered a pod. Ladders were used to reach the various bins on the carousel. 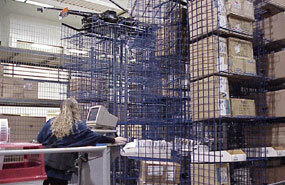 TTI's automated system would assign a tote to each order. At any point in time, TTI had over 4,000 totes in operation. TTI found that managing the totes was becoming a bigger issue than managing the product itself. Beasley smiled and commented, "I found myself having nightmares about our sea of totes!" Once an item was picked it sat in the tote until other items were complete. This occupied valuable space and slowed the overall process. Upon completion of their picks, the operator would set the tote in front of their workstation awaiting a dedicated delivery person to move it to its next station. This was slow and left the door open for quality issues. "Anytime a picker has to leave her workstation in the course of a day," commented Golden, "it opens up the potential to lose focus, and increases the possibility of someone making a mistake." TTI realized it was not in the business of managing totes, but in the business of efficiently fulfilling customer orders. Operators would often run out of totes since they had to be hand-carried between picking stations and consolidation. Gene Pfretzschner, Director of Logistics, commented, "During this time, TTI was experiencing rapid growth and space was at a premium. As I reviewed our warehouse flow, I found not only the management of totes to be slow and complicated, they were occupying valuable warehouse space." "It's hard for 4,000 totes to look neat," said Beasley. Totes have been eliminated from the company's picking operations. The core of the solution proposed by Cisco-Eagle involved a system that helped TTI level its processes. TTI was able to progress at a more appropriate pace, despite relentless growth. "Mechanization improves quality and customer service," said Pfretzschner. "If you compare us to some of the other distribution houses, you see conveyors you have to walk over or around on their floors. 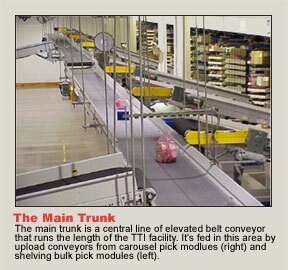 Other than in shipping, our entire conveyor system is elevated. 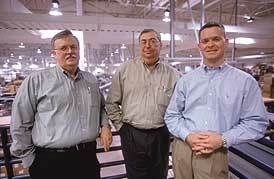 Consultants suggested that we run conveyors on the floor, and segment the plant." "Those were the same consultants who told us we couldn't do this without totes," added Beasley. The system Cisco-Eagle designed had an instant impact in terms of productivity. "The very first day, we saw a 20% productivity increase," Beasley commented. "Today we've seen an increase of 30%. And I can't calculate how many additional people it would have taken to move the number of totes we would have needed to handle our current growth." Despite the rapidly increasing levels of business, TTI has managed to design an operation that let it do more in what appears to be a more orderly manner. The reality is that more is being done than ever before. "Visitors are amazed at how quiet and orderly our warehouse is," Golden said. "The facts are: the company has grown 125% during this time and our staffing has only grown 20%. We have also seen a dramatic improvement in our quality and a significant reduction in our cycle times." "We take orders until 7:00 in the evening and ship it the same night to the West Coast to support those customers," said Beasley. "In the past, you might pick an order, and put the tote out, but it might not get picked up for thirty minutes." Now, the picker puts orders on the conveyor, and it is instantly headed to shipping. Delivery times were as much as an hour. Now, delivery of a picked order is four minutes. TTI estimates that it's saved a minimum of 50% on travel time for orders. Beasley commented, "I must say the implementation of our new conveyor and lift table system has surpassed all of my expectations. Not only did we achieve the obvious improvements, but also, it's had a profound impact on our customer service and quality. Without exception our customer feed back has recognized our warehouse and operational capability as being Industry Best." TTI saw benefits throughout the operation, not just on the processing end. The flow of product improved with single item picking, which allowed elimination of people needed to take totes from one end of the building to the other. The improved flow of the product led to improved performance in the consolidation and shipping areas. A high priority was to be able to convey fragile components without damaging them. 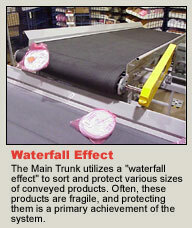 Because of the way the system handles large and small items together, there is virtually no product damage. "There have been two keys in our relationship with Cisco-Eagle," Beasley said. "One was that when we came up with ideas, Cisco-Eagle would make them work. Every time we came up with a concept, Cisco-Eagle's response was "let us see what we can do," and that was important to us. The other was the flexibility of understanding our business, and fitting into our daily business. "We have to give credit to the installation and engineering personnel. You expect this kind of an attitude from a company's sales group. Both site managers we had in here were responsible. They were just as sensitive about working under the conditions we laid down as the management." "The care and the respect for our equipment, and the care and respect for our facility as a whole was significant," Pfretzschner added. "The installation crews did everything to make sure the site was clean, and that it was safe, and that they worked with our people." "We've increased quality and productivity," said Beasley. "We have a better work environment. We improved the things like efficiency, and the quality of our work life. We simplified our process and improved every aspect of the operation."